-First off, I really hope this is a bug and not intentional considering it's been an issue for myself for a while now. If it was intentional, I would like to make a request to have it changed back. 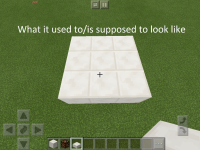 -Something I have learned over my Minecraft building experience is that the Block of Quartz most replicates the look of ceiling tiles. -After building my entire school in Minecraft (most of the ceilings are blocks of quartz), and shortly after an update (what I believe to be 1.2.15 (for sure) and maybe even 1.2.14), I was working on the exterior when I noticed that the ceiling throughout the building didn't have the appearance of ceiling tiles like how I had intended and how it was before. 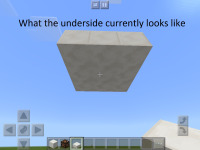 After investigating a little bit I came to the conclusion that the texture on the bottom of the block had been altered (see images below). -This makes for some lousy looking ceiling tiles and I eventually want to make the school presentable. The texture not being what it used to be before does not make it look as presentable/professional as it did before. 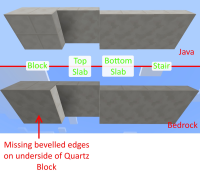 Replacing every single quartz block in the building would take hours upon hours because there's so much of it and redstone runs all above the blocks to the very many lights. -However, this may be an issue with my iPad because it had/has many issues software related (specifically operating system issues), but I don't see that being the case considering Minecraft has been working properly on my iPad since 2014 and continues to work fine.